Aim: This study aims to evaluate the effect of saliva and blood contamination on the shear bond strength (SBS) of self- and total-etch adhesive systems on enamel and dentin. Materials and Methods: Sample of 100 extracted noncarious primary molars were taken as experimental groups, which were divided into two groups: self-etch group and total-etch group containing fifty teeth each. These groups were further divided into five subgroups - 10 teeth each. The specimens were then subjected to contamination with saliva or blood; before and after application of adhesive agent, whereas, in control group, there was no contamination done before and after adhesive application. Fresh saliva and blood were used. After the bonding procedure, resin composite was built up with diameter and height of 3 mm. After that, the specimens were tested for SBS in universal testing machine at a crosshead speed of 1 cm/min. The results were then statistically analyzed using one-way ANOVA. Results: The results of the study revealed that the SBS of self-etch adhesive system was better than the total-etch adhesive system and there was significant difference found among various subgroups of total-etch group, i.e., when adhesive application was done before, after and without saliva or blood contamination. There was no significant difference found within the subgroups of self-etch group when adhesive application was done before, after, and without saliva contamination. In case of blood contamination, significant difference was found in SBS in both self- and total-etch groups. Despite considerable advances in the prevention of dental caries, pediatric dentists still deal with cases of total destruction of the primary teeth. In earlier times, there was scarcity of materials that adhered to enamel and dentin and caused more removal of tooth structure during cavity preparation. Due to advancements in esthetic dentistry, a conservative approach for cavity preparation has been made possible which has changed the outlook of it. Adhesive dentistry has revolutionized the paradigm of esthetic dentistry. It has come a long way from the era of no etch to total-etch to self-etch. As failure of these restorations in primary teeth is common owing to smaller tooth size & conservative cavity preparation leading to poor performance of these materials when used in primary dentition. Failure of these restorations in primary teeth is common owing to smaller tooth size and conservative cavity preparation leading to poor performance of these materials when used in primary dentition. The breakthrough in the etch-and-rinse (total-etch) approach was first described in the late 1970s by Fusayama et al., Bertolotti and Kanca. In recent years, self-etch adhesives for bonding to enamel and dentin have been introduced, and some adhesives have added fillers to improve physical properties. The bonding and bond strength of different adhesive agents are influenced by numerous factors such as saliva, gingival fluid, blood, method of preparation of dentin surface, and composition of adhesive materials. Saliva and blood are two common contaminants that can affect the prepared tooth surface during placement of adhesives in restorative dental treatment. Clinicians must consider the effects of oral fluids on bond strength during the clinical application of bonding systems. Since there may not be much literature available on the bonding to primary enamel and dentin han the permanent teeth. Therefore, this study was conducted to evaluate the shear bond strength (SBS) of self- and total-etch adhesive application to enamel and dentin before and after contamination with saliva or blood. The present study was carried out at the Department of Paedodontics and Preventive dentistry in Himachal Institute of Dental Sciences, Paonta Sahib (Himachal Pradesh), with the objective to assess the effect of saliva or blood contamination on the SBS of self- and total-etch adhesive systems on enamel and dentin. The study was conducted on 100 extracted noncarious deciduous molars. Total-etch adhesive system (BEAUTIBOND- Shofu). Freshly extracted teeth were washed under running water and scrapped off using an ultrasonic scaler. The teeth were then stored in normal saline at room temperature till further use. The teeth were sectioned buccolingually through the center using a diamond disc in a low-speed straight handpiece (NSK). Each section was mounted on the self-cure acrylic resin blocks prepared in a particular shape. The prepared samples are shown in [Figure 1]. Fresh unstimulated saliva and fresh human blood from fingertip were used for the study. Each group was further subdivided randomly into five subgroups of ten teeth each depending on the type of contamination subjected to and the steps in the bonding sequence when contamination occurred that was before or after adhesive application. The various groups and subgroups are shown in [Table 1]. Subgroup I – A1(S): In this group, the specimens were subjected to contamination with saliva for 15 s using microbrush. After contamination, the surfaces were rinsed and dried for 10 s, and then, the self-etch adhesive was applied. Light curing was done using a curing device for 10 s.
Subgroup II – A1(B): In this group, the specimens were subjected to contamination with blood for 15 s using microbrush. After contamination, the surfaces were rinsed and dried for 10 s, and then, the self-etch adhesive was applied. Light curing was done using a curing device for 10 s.
Subgroup III – B1(S): In this group, the self-etch adhesive was applied to dentin. And then, the surfaces were subjected to contamination with saliva for 15 s and then rinsed and dried as in Subgroups I and II. Subgroup IV – B1(B): In this group, the same procedure as in Subgroup III was followed except that the specimens were subjected to contamination with blood. Subgroup V – (C1): In this group, the specimens were not subjected to either blood or saliva contamination. Self-etch adhesive was applied to dentin of each specimen of group. Subgroup I – A2(S): In this group, first of all, etchant was applied to the prepared tooth surfaces and left for 15 s. Then, the surface was subjected to contamination with saliva for 15 s using microbrush and then rinsed and dried for 10 s. Immediately after drying, 2–3 consecutive coats of the adhesive were applied for 15 s with gentle agitation using a fully saturated applicator. The adhesive was then light cured for 10 s using a curing device. Subgroup II – A2(B): In this group, first of all, etchant was applied to the prepared tooth surfaces and left for 15 s. Then, the surface was subjected to contamination with blood for 15 s using microbrush and then rinsed and dried for 10 s. Immediately after drying, 2–3 consecutive coats of the adhesive were applied for 15 s with gentle agitation using a fully saturated applicator. The adhesive was then light cured for 10 s using a curing device. Subgroup III – B2(S): In this group, the total-etch adhesive was applied to dentin. And then, the surfaces were subjected to contamination with saliva for 15 s and then rinsed and dried as in Subgroups I and II. Subgroup IV – B2(B): In this group, the same procedure as in Subgroup III was followed except that the specimens were subjected to contamination with blood. Subgroup V – (C2): In this group, the specimens were not subjected to either blood or saliva contamination. Total-etch adhesive was applied to dentin of each specimen of group. After the bonding procedure, resin composite (Filtek, 3M ESPE) was built up in increments of 1 mm using plastic mold. The plastic straw filled with composite was placed securely on dentin test surface of the samples with the help of teflon-coated carrier and condensed. The composite resin was then light cured for 30 s using curing light. The plastic straw was removed from the cured composite by splitting it with a B.P blade and removing with the help of a tweezer while applying minimal force so as to avoid any harm to the bonded composite resin cylinder. The extra cured composite resin was removed with the help of composite finishing stone. After polymerization, the mold was removed, and specimens were placed at 37°C in distilled water for 24 h before SBS measurement in a universal testing machine at a crosshead speed of 1 cm/min. The collected data were statistically analyzed using two-way ANOVA. Results of the study revealed that the SBS of self-etch adhesive system was better than the total-etch adhesive system and there was significant difference found within total-etch group when adhesive application is done before and after saliva contamination. It was concluded that there was decrease in bond strength due to blood or saliva contamination as compared to without any contamination, i.e., control group. 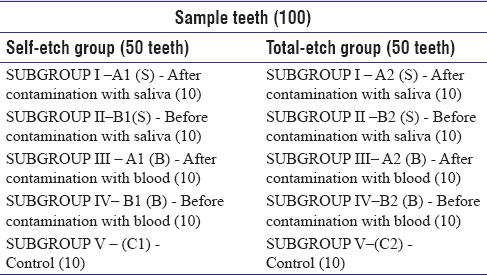 Comparison of mean SBS of total-etch adhesive and self-etch system before, after and without saliva or blood contamination in given [Table 2]. [Table 2] shows that the mean SBS of total-etch adhesive which was applied after saliva contamination (0.9360 Mpa ± 0.35) and after blood contamination (0.9600 Mpa ± 0.36) is less than self-etch adhesive applied after saliva contamination (1.1060 Mpa ± 0.58) and blood contamination (1.0050 MPa ± 0.28). The bond strength of total-etch adhesive applied before saliva contamination (0.9140 MPa ± 0.26) and before blood contamination (0.6860 MPa ± 0.21) is more than the bond strength of self-etch adhesive applied before saliva contamination (0.8950 MPa ± 0.42) and before blood contamination (0.6380 ± 0.25 MPa). However, the mean bond strength of total-etch adhesive applied without any contamination, i.e., control (1.0300 MPa ± 0.19) is less than self-etch adhesive applied without any contamination, i.e., control group (1.2420 MPa ± 0.32). Hence, there is decrease in bond strength of both self-etch and total-etch adhesive system applied before contamination with saliva and blood as compared to after contamination. The mean bond strength of self-etch adhesive applied without any contamination showed better bond strength than total-etch adhesive applied without any contamination. [Table 3] shows that there is no significant difference in bond strength found between control group and adhesive application before and after blood contamination in both self- and total-etch groups. Furthermore, in saliva contamination groups, there was no significant difference found when adhesive application was done before and after contamination in self- and total-etch groups. The basic concept of adhesion is “The closer the contact between the adhesive and the adherent, the stronger is their junction.” Micromechanical interlocking and chemical interaction between functional monomer and tooth substrate are the prerequisites for achieving good bonding. One factor that can affect adhesion and retention of resin restorative materials is contamination of the field with saliva and blood. The rationale behind the use of the self-etching systems is the formation of continuity between tooth surfaces and adhesive material, which is accomplished by the simultaneous demineralization and penetration of its agents. This could be an advantage compared to the claimed technique sensitivity of conventional total-etch dentin bonding agents in pediatric patients. The present study evaluated the SBS values of an etch-and-rinse and self-etch adhesive systems after saliva or blood contamination on human deciduous molars. There is a plethora of information available on the mechanism of adhesion for bonding systems on permanent teeth. Hence, we conducted this study to evaluate the bonding efficacy of adhesive agents on primary teeth. Since less technique sensitive bonding system would always be much preferred in pediatric dentistry. Rinsing and drying was done for 10s. However, Pashley et al and Fritz et al observed a reduction in bond strength when etch-and-rinse adhesive was contaminated by water, saliva or blood; they attributed the lessening of adhesion to the presence of salivary proteins occluding the openings of dentin tubules. The main objective of bond strength test is to establish a demonstrative value for how strong the bonding of an adhesive system is to dental hard tissues when composites are bonded. The results of this study revealed that saliva contamination before the application of an adhesive shows comparatively higher bond strength values than contamination after adhesive application in case of self- and total-etch adhesive systems. However, blood contamination before adhesive application showed higher bond strength in case of total-etch adhesive as well as self-etch system. Contamination before application of bonding agent by both saliva and blood showed almost similar bond strength values. The result of the present study is in agreement with the result of an earlier study done by Fritz et al. using a one-step adhesive, which concluded that in a one-bottle adhesive system, any contamination of the already cured adhesive layer seriously compromises the bond strength. Hitmi et al. and others also reported that salivary contamination of the cured adhesive layer decreased SBS dramatically. The present results are consistent with the study conducted by Mithiborwala et al. who concluded that there is increased thickness of hybrid layer in primary teeth by 25%–30%. The density and length of the resin tags were found to be quite adequate in self-etch adhesives due to the milder acid etching in these systems. Whereas in case of total-etch adhesives, acids which are too aggressive, expose collagen so deeply that current dentin adhesive resins may not penetrate completely, leaving behind an uninfiltrated weak collagenous layer of dentin susceptible to long-term degradation and low bond strength. On the contrary, Dey S et al(2016) concluded that the total-etch adhesive systems showed better bond strengths than the self-etch systems in permanent teeth, in all the situations where different contaminants were used. It is likely that contaminants may have remained on the dentin surface, thus interfering with the formation of a hybrid layer or inhibiting the bonding of adhesive system to composite. Therefore, the most important factor for ensuring optimal bonding is to avoid saliva and blood contamination. Even if modern adhesive systems are easier to use, bonding still includes different steps, and saliva or blood contamination may occur at different stages. Reliable bonding systems have revolutionized the practice of adhesive dentistry although improvements in bonding techniques and systems have to be continued. Walia R, Kakkar A, Ahuja L, Jasuja P, Verma KG, Juneja S, et al. Rehabilitating grossly decayed primary anterior teeth: How and why? Int J Oral Health Dent oct-dec 2015;1:187-9. Gupta N, Tripathi AM, Saha S, Dhinsa K, Garg A. Effect of saliva on the tensile bond strength of different generation adhesive systems: An in-vitro study. J Clin Diagn Res 2015;9:ZC91-4. Uppin VM, Sarangi P, Satapathy SK. Evaluation and comparison of shear bond strengths of self etching primers to dentin – An in-vitro study. Dent J Adv Stud 2014;2:91-5. Chandki R, Kala M. Total etch vs. self-etch: Still a controversy in the science of bonding. Arch Oral Sci Res 2011;1:38-42. Shashikiran ND, Gunda S, Subba Reddy VV. Comparison of resin-dentine interface in primary and permanent teeth for three different durations of dentine etching. J Indian Soc Pedod Prev Dent 2002;20:124-31. Strassler HE, Mann M. Dental Adhesives for Direct Placement Composite Restorations. Available from: http://www.ineedce.com/2011/dentsply_adhesives/. [Last accessed on 2016 Jun 22]. Kilic K, Arslan S, Demetoglu GA, Zararsiz G, Kesim B. Do blood contamination and haemostatic agents affect microtensile bond strength of dual cured resin cement to dentin? J Appl Oral Sci 2013;21:85-91. Hitt JC, Feigal RJ. Use of a bonding agent to reduce sealant sensitivity to moisture contamination: An in vitro study. Pediatr Dent 1992;14:41-6. Kim J, Hong S, Choi Y, Park S. The effect of saliva decontamination procedures on dentin bond strength after universal adhesive curing. Restor Dent Endod 2015;40:299-305. Gateva N, Dikov V. Bond strength of self-etch adhesives with primary and permanent teeth dentin – In vitro study. J IMAB 2012;18:168-73. Guerriero LN, Vieira SN, Scaramucci T, Kawaguchi FA, Sobrel MAP, Metos AB, et al. Effect of saliva contamination on the bond strength of an etch-and-rinse adhesive system to dentin. Rev Odonto Ciênc 2009;24:410-3. Tuncer D, Basaran S, Halaçoglu DM, Yamanel K, Çelik Ç, Arhun N. Effect of haemostatic agent application on the shear bond strength of contemporary/multi-mode adhesive systems. Oral Health Dent Manag 2014;13:103-6. Guerriero LN, Scaramucci SNV, Kawaguchi FA, Sobral MAP, Matos AB, et al. Effect of saliva contamination on the bond strength of an etch and rinse adhesive system to dentin. Odonto Cienc 2009;24:410-413. Koppolu M, Gogala D, Mathew VB, Thangala V, Deepthi M, Sasidhar N. Effect of saliva and blood contamination on the bond strength of self-etching adhesive system – An in vitro study. J Conserv Dent 2012;15:270-3. Fritz UB, Finger WJ, Stean H. Salivary contamination during bonding procedures with a one-bottle adhesive system. Quintessence Int 1998;29:567-72. Hitmi L, Attal JP, Degrange M. Influence of the time-point of salivary contamination on dentin shear bond strength of 3 dentin adhesive systems. J Adhes Dent 1999;1:219-32. Mithiborwala S, Chaugule V, Munshi AK, Patil V. A comparison of the resin tag penetration of the total etch and the self-etch dentin bonding systems in the primary teeth: An in vitro study. Contemp Clin Dent 2012;3:158-63. Ajami AA, Kahnamoii MA, Kimyai S, Oskoee SS, Pournaghi-Azar F, Bahari M, et al. Effect of three different contamination removal methods on bond strength of a self-etching adhesive to dentin contaminated with an aluminum chloride hemostatic agent. J Contemp Dent Pract 2013;14:26-33. Dey S, Shenoy A, Kindapur SS, Das M, Gunwal M, Bhattacharya R. Evaluation of the effect of different contaminants on the shear bond strength of a two-step self-etch adhesive system, one-step, self-etch adhesive system and a total-etch adhesive system. J Int Oral Health 2016;8:1-7.